Lahore: DIG Ops Dr Haider Ashraf has appointed the SIs as SHOs who passed the departmental exams with flying colours.The DIG met these brilliant cops in his office and directed them to serve the masses with the passion of service and curb the crimes in their controlled areas. According to the notification , SI Shakoor Baig to Hanjarwal , SI WAqas to Sherakot , SI Muhammad Tanveer to North Cantt , SI Muhammad Zubair to Defense A , SI Zia ul Haq to Defense B and SI Bilal Hanif is posted to Ichra as SHO. 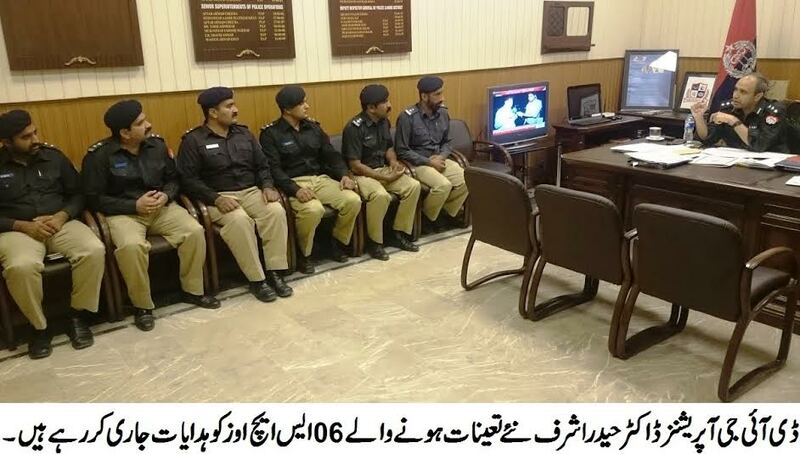 Meanwhile; Inspector Sohail Kazmi from police lines to SHO Raiwind City,Inspector Rai Nasir to SHO Sattokatla and Majid Bashir from North Cantt to Nawab Town. Moreover Dr Haider Ashraf has suspended senior clerk Muhammad Farooq for not keeping the record up-to-date.